What is the meaning of oil? A dictionary would define it as any one of a great variety of unctuous combustible substances, not miscible with water. Oil – It is one of the most important part of an engine. What blood is to us humans is what oil is to engines. Oil serves several important functions in an engine mainly lubrication, cooling, efficiency, anti-rust agent, protection etc. What oil does for the motor is generally known to all. But what is relatively unknown are the different standards and quality of oil that are available in the market. There are several different ways of ascertaining the properties of an oil the most commonly used ones are the codes such as SAE, JASO, MA, MA2, 20W40, 20W50, 10W30 etc. etc. These codes are usually found on oil containers for the purpose of easy identification and classification. Multi grade Oil: Suitable for both vehicles like Diesel and petrol/LPG/CNG. Single Grade Oil: Suitable for petrol or diesel, depending on oil grade. EP or Extra Pressure is suitable for only gearbox applications. This grade type is not suitable as an engine oil and is also not suited for gear boxes of two stroke engines. In two stroke engines, regular engine oil is recommended as per the manufacturer. Petrol Engine Grades :- SA, SB, SC, SD, SE, SF, SG, SH, SJ, SL, SM. Diesel Engine Grades :- CA, CB, CC, CD, CD-II, CE, CF, CF-2, CF-4, CG-4, CH-4, CI-4, CJ-4. We all have motorcycles with petrol engines, hence the manufacturer would only recommend “S” grade oils In which, most people prefer API/SAE-SL/SM (JASO MA or MA2). SM is relatively a good grade of oil which has better oxidation resistance, deposit protection, wear protection and low temperature performance. There are a lot of imported oils suitable for Indian motorcycles. But one thing to remember is that foreign bikes and riding conditions differ from Indian ones so those oils would be more suitable for higher CC engines and not Indian motorcycles also most vehicles abroad employ dry clutch systems for which a different grade of oil would be recommended by the manufacturer when compared to Indian bikes because in Indian we only have motorcycles with wet clutch systems, which highlights the fact that the best oil for your bike would be the manufacturer recommended grade. But that isn’t the end of the story here as we can use grades of slightly better quality provided it falls in the same category. For example if the manufacturer recommended oil grade is API SL(JASO MA) and if, in the market, the oil company introduces a newer grade of the same oil like API SM (JASO MA2), then we could buy it. Sometimes mechanics pour oil which into petrol engines which are more suited for diesel engines. Hence one needs to ensure the grade of the oil used starts with the letter “S” (e.g. SC,SM). If the mechanic uses something else, it would be best to help him understand the grade types. For better understanding refer to the following information on the qualities of various grades. -18° C (0° F) – 5W-20, 5W-30, 10W-30, 10W-40. BELOW -18° C ( 0° F) – 5W-20, 5W-30. The above represents the temperature below which the consistency of the oil would deteriorate. In the same grade, there are a few more different type of oils based on their contents, for example mineral, semi synthetic and synthetic. Mineral oils are based on oil that comes from our dear old Mother Earth which has been refined. In simple language NATURAL OIL. What is the meaning of Semi Synthetic Oil? Semi-synthetic oil, is a mixture of natural and artificial oils. It is safe to mix the different types, but it’s wiser to switch completely to a new type rather than mixing. It is good to use flushing liquids before our mechanic friend pours in new oil. Usage of flushing liquids are advisable once or twice a year, It also depends on kilometers covered. Do not use kerosene, diesel or petrol as a flushing liquid for removing carbon. It may damage the bearing surface and it’s oil filming. Please read all the intsructions before using flushing agents. Do not mix mineral oil with synthetic or semi synthetic when we top up the oil level. New grade oils have better detergents that remove the carbon content. So try to use new grades rather than old. Do not use car engine oils for motorcycle purpose. That may harm the motor. Car engine oils content with friction reducers. 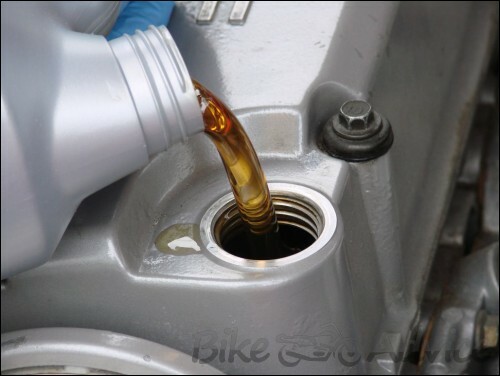 Two wheeler engine oils – specifically four stroke engines with a wet clutch multi plate setup do not need oils with friction reducers as they can increase or decrease the friction, If we use friction reducer then the clutch will start slipping fast at high rpm or at the time or heavy load and high torque. Soon we will be hearing about ILSAC grades:- International Lubrication Standard Advisory Committee. Due to limitations we can’t publish a detailed oil grade chart. In the market there are lots of Oil companies, with various different types of oils for almost all types of engines so producing a detailed list would be really time consuming. I would, later on, post a chart on the most common and important oil grades.